Long term group work by small teams is a central part of many learning and workplace activities. Widespread group support tools such as wikis, version control systems and issue tracking systems are an invaluable aid for groups. They also have the potential to provide evidence for valuable models of the group activity. This paper describes Narcissus, designed as a new way to improve group-work by exploiting evidence from use of such group-work tools, to create a visual presentation of a group model. The Narcissus models and interfaces were designed to help groups function more effectively. It helps individuals see how well they are contributing to the group. It enables groups to assess contributions relative to plans. And it helps facilitators identify problems. The Narcissus interface supports scrutability and control over its models. We report a four part evaluation of Narcissus: individual level with 23 students; group level by 5 groups; facilitator level with 5 facilitators; and fine grained study with 8 students. Results indicate that all these groups were able to understand and use Narcissus and that they considered it effective in modelling the group activity in useful ways. They particularly valued the support for scrutability. 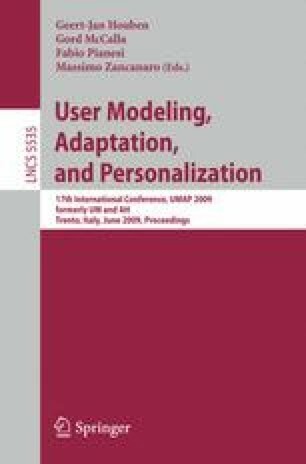 Key contributions of this work are the creation of a scrutable and user controlled group model to support group work and to provide a new form of navigation interface for a complex groupware site.